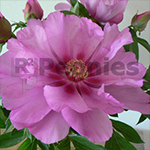 First Arrival is an extreme beautiful, lavender/purple and semi-double Intersectional Hybrid Peony with an exceptional colour and slightly darker heart. First Arrival has a light fragrance and blooms in the midseason. With flowers up to 20 cm and the dark foliage it’s an eye catcher in your garden. Every year older the plant gives more flowers which become even more double. First Arrival has a very powerful growth and is blooming easy. First Arrival is also after the bloom period until the upcoming frost in the late autumn a welcome decoration in your garden or park. The green foliage changes into beautiful Indian summer colours in the fall.